When freshly-placed concrete reaches 500 psi (35 kg/cm2) it has reached its initial set, when it can no longer be worked or consolidated by vibration. 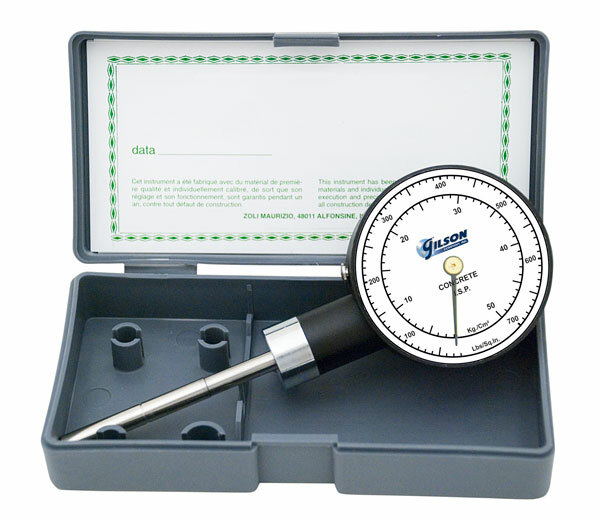 Model HM-78 dial penetrometer gives instant field or laboratory estimates of concrete condition by simply pressing the 1/20 in2 (32.3mm2) plunger into concrete at a constant rate to 1" (25.4mm) marked depth. The 2.25" (57mm) diam. dial has dual scales of 0-700 psi and 0-50 kg/cm2, and readings are locked until released by push-button. Calibration is user-adjusted using an ordinary scale by addition or removal of register plates provided. Plastic case and instructions included. Overall length: 6" / 152mm.